One of Concord’s brand-spankin’ new meetup groups is gaining traction (winter pun intended) in the area. The Concord NH Trail Runners was started in October when two people moved to the area and were looking to run with some friendly people. As the group was growing, it was decided the mission was to provide an avenue for Concord-area runners who want to run on trails, spend time in nature and meet other trail runners. “Its for all abilities, all paces, and all distances. If you’re a novice to trail running and you want to try something new, join us. If you’re an ultra runner who wants to find others to run with, join us. If you’re somewhere in between, join us. Come one, come all, let’s run the fantastic trails of Concord,” according to the Meetup.com page. We caught up with Katharine Woodman-Maynard, the group organizer, to find out more about the group. Around Concord: Please tell us again what the official name of the group is. When did it come about? How did you/the founders come up with the idea to put it together? Katharine Woodman-Maynard: Concord NH Trail Runners. Mike and I moved from Sunday River area of Western Maine to Concord at the end of October. As soon as we arrived we started running with the friendly people at Runner’s Alley but noticed that most runners there were road runners. In an effort to introduce people to trail running, and meet other trail runners, we decided to start this group. AC: How often/when do you meet? What types of activities do you do at your meetings? How about outside of the meetings? Woodman-Maynard: We meet every two weeks, generally on Sundays at 9 a.m. at a trail in or around Concord. We try to plan for different distances so people can run a shorter distance if they choose, but in general the core run is between five to ten miles. We also encourage others to post their own runs on our Meetup site if they want to organize one. AC: If I’m a newbie and want to get involved, how do I go about doing it? What benefits does each group serve its members? Join our Meetup group to get updates on the run locations and times. In general it’s good to already be a runner since trail running can be challenging technically. Besides introducing trail running to road runners, the group is a great way to learn about new trails in the area and meet other trail runners. 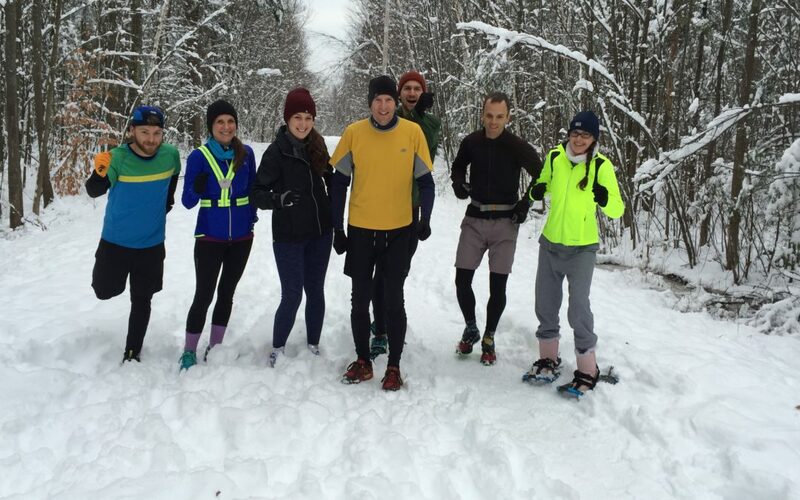 Also, as winter envelopes the city, we’ll have a chance to learn from each other about running on trails in the snow. AC: What is the most interesting thing you’ve learned through the endeavor? Woodman-Maynard: It is difficult to plan runs on overlapping trails through the woods with an eye on how to keep people from getting lost! Concord has a lot of marked trails, but very few trail systems are marked for more than a couple miles. This is too short for most of our runs so we have to get creative in how we mark the unmarked trails that we use on group runs. We do everything from marking snow with cranberry juice and tying ribbons (which we take down). AC: Could you go into more detail about all of the different activities that your meetup group hosts (as seen on the group’s meetup page)? What are the benefits? Why do you think the community at large benefits from these particular types of activities? Woodman-Maynard: We love trail running because it’s physically and mentally engaging. You have to be aware of your environment in order not to fall or get lost. And you have to adjust your movements and speed according to the terrain around you. It’s a good metaphor for life. This may be getting ahead of ourselves a bit since we’re so new, but if enough people start trail running, that’s a whole new community that will be interested in the open spaces in and around Concord. Concord has a great mix of city and wilderness and trail runners could be a great resource for helping the two get along. In our short time here thus far, we already see that Concord has a lot of potential to become a trail running city. We look forward to exploring and connecting it all. AC: What are your plans with your group in 2015? Goals/events/new ideas? Woodman-Maynard: Since we’re such a new group, we really just plan to hold more Meetups with the hope of connecting with more runners. We do have some other ideas up our sleeves, but you’ll just have to join to see what we decide to go with. AC: What makes Concord special to you in terms of your passions? How about the members of your group? Do you and your group have favorite hangouts/places to go/things to do? Woodman-Maynard: We’ve been astonished at the strength of the community of runners centered around Runner’s Alley, which only opened it’s doors on Main Street in May. They do weekly runs on Thursdays at 6 p.m. and Saturdays and8am and are a large group of enthusiastic runners. The Runner’s Alley staff has been very supportive of our trail runs. They also have a lot of great gear to help anyone new to trail running. AC: What other information would you like to pass along? Parting words for the community? Woodman-Maynard: Get out on the trails!